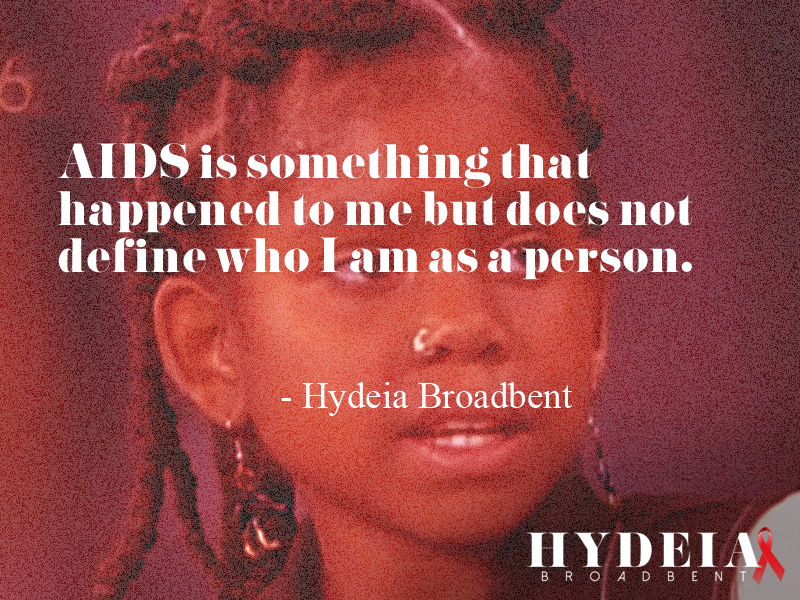 My take away from Basketball Wives: Draya/Brandi cancer is boring. So one of my many faults is that I’m a lite weight reality show junkie, I am actually doing better and I’ve decided to start dropping certain shows off of my roster , you know in the efforts of cleaning up some of my mental space. Well Basketball wives LA is not one I am giving up as of now. I felt compelled to write a blog about the airing that just took place on August 30, which is a Sunday or I had to catch up on Monday. (church all day/keep the Sabbath holy Sunday) so I’m a day late and probably a dollar short on the conversation. 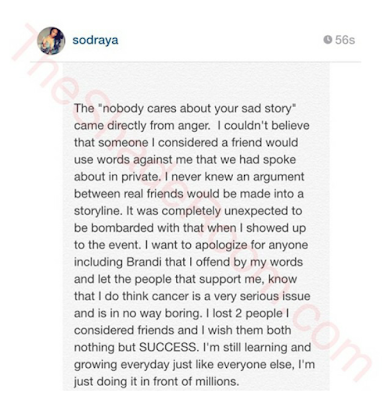 I have to say some maybe surprised but I am team Draya, BEFORE I am attacked please hear me out. After all this time majority of the viewers and audience of the show have stayed because of Draya. As a viewer all the other cast members on the show I find very boring. I feel like since Draya has started to reach certain points her in career she has become the target and can we say the “NeNe Leakes” of Basketball Wives? Many viewers are compelled by her story and like it or not many young women can relate to having a rocky background in their youth. What Draya possesses is an unseen ability to connect with people and as much as people try to knock it, she still able to move forward. For myself what I like in Draya is her hustle and business mind, while I do not personally know Draya I am speaking from the perspective of a viewer and a person who’s been studying reality T.V. 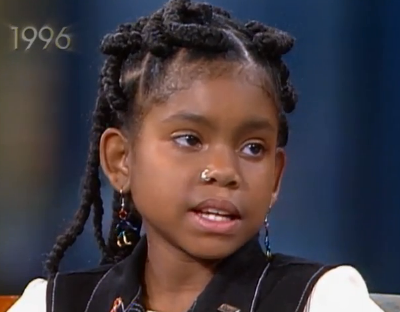 I love the fact she has done something positive with her life with the platform she was allotted. I wanted to write because I feel like all season Draya has become an unfair target, the conversation that happened behind screens seems to have been mistaken and construed for Brandi to have a storyline. Sorry but I fast forward when she starts to talk about her cheating husband, that story line does nothing for me. Do I think cancer is sad? Yes absolutely, I lost a very dear friend and mentor to cancer and seen cancer affect my family first hand. I have countless friends who have been affected by cancer; I believe we all have seen the devastating effects cancer has had on our society. Now with the format of Basketball wives do I think it’s a great story line, I wish I could say yes. I wish the target audience that they go after, could really find some value in it and maybe they did, last season. Do I think Draya was speaking directly about cancer no. In terms of reality T.V. and what sales, the cancer story line was simply not enough. Since Draya’s arrival on the show I have to say she’s carried it, wackie Jackie does help. 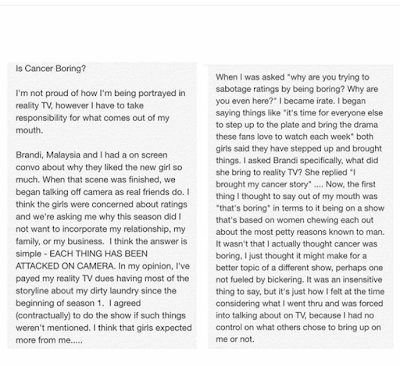 I was recently watching an episode of Livin Lozada and it was mentioned that Evelyn “helped” or “carried” her former crew and this say statement can be said about Malaysia, Brandi and Draya scenario. I believe producers went to Brandi and made it known she needed to bring more it amp it up, maybe its built up anger from the cheating husband but Brandi has been real extra this season. 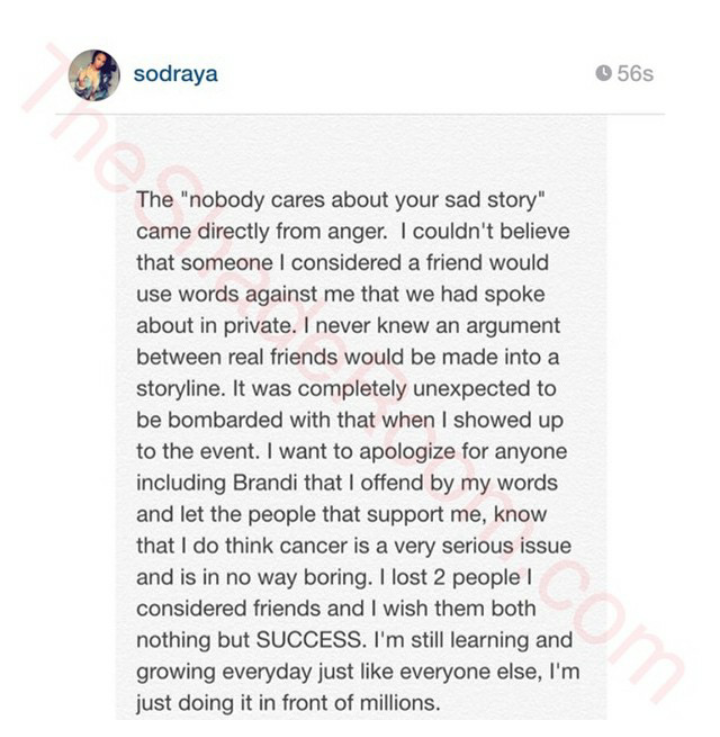 Should we as viewers be surprised at the turn of events and the attack on Draya, nope. When people need a story line to stay afloat they will use any little thing and I believe Brandi used this to her advantage. I truly do believe the statement was taken out of context. With everything that unfolded and Draya’s unwillingness to speak on her relationship this season I now understand and see why Shaunie and Tami were added to the LA cast. This maybe the end of Basketball wives for me unless Angel stays on; I’m interested in her story and seeing more of her. Now before anyone brings up the infamous “Hoeness can be deleted” comment Draya made, I really wish she was better at articulating her words/sentences. Can one sexual ways or experiences be deleted? Of course not, can one grow, learn, heal and repeat from these experiences, absolute. There are many women with some sketchy past who have turned a new leaf and become productive women, many in entertainment, politics and many can be found right in church. Ever wonder how those with so much wisdom gained all that knowledge? Probably from messing up in they’re youth.